Users interact with the Web in real time. Then the real-time artifacts are left as monuments. The artifacts are not trash per se; but like discarded trash, become idle elements, prime for perusal. Sometimes one becomes ‘cool’ with others through mutual acquaintances. Let’s use Wayne Barker as an example (We know that stellar chap, eh?) Let’s say I don’t know Wayne; but I know Anthony Nelson. 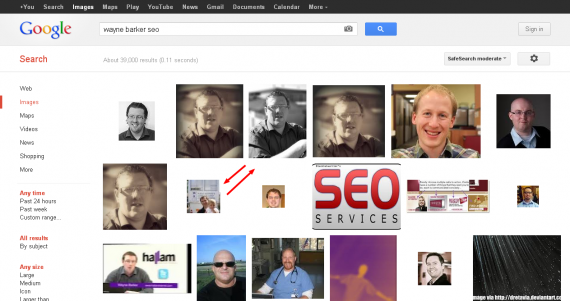 Anthony appears on the Google Images search for ‘Wayne Barker SEO’? Ah, I see. Wayne liked and shared an Anthony Nelson interview. He may now know (or want to better know) Anthony. Anthony is the ‘common relation factor.’ The mutual acquaintance/interest can (perhaps) help forge relations with Wayne. In a future outreach attempt, I could include the fact that I know Anthony (maybe also read the interview) and could introduce them (if they are not already well acquainted). Most of us have immediate and extended families. There’s a common bond there. I often notice people share information about their families. Family matters. (Hey, that includes dogs and kitties too!) 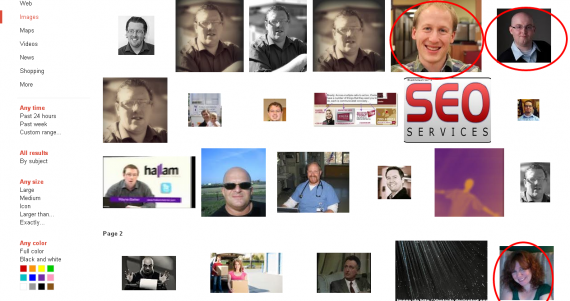 In perusing our ‘Wayne Barker SEO’ Google Images search, I see Wayne is with child in a Linked In photo. The SEO master and toddler toter are one in the same! 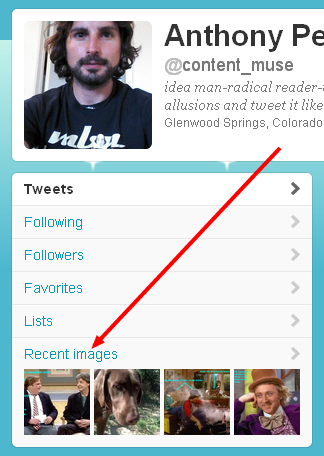 In future attempts in contacting Wayne, I wouldn’t mention looking at pictures with him holding children. (That’s creepy.) Rather, if I (have children, babysit, teach toddlers, etc) I may passively mention it for commonality’s sake. Again, it’s a common bond. Relations are formed through common associations. What if I want to better communicate with Wayne on a professional level? I know he is interested in “SEO.” But what are his refined online marketing interests. User experience? Pay-per-click? Link building? 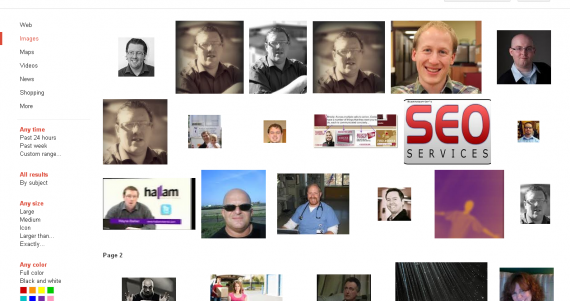 Let’s use our ‘Wayne Barker SEO’ image search again, looking for clues associated with Wayne’s specific interests. 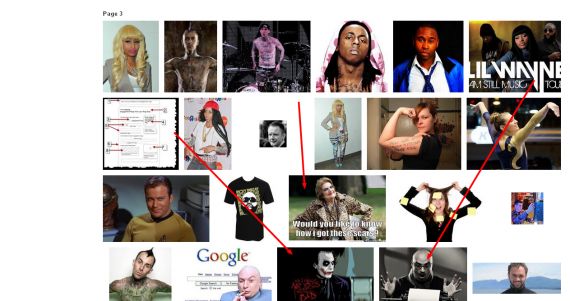 Combing through the first few pages of the search, I notice Wayne is a reader of Triple SEO, Chris Dyson’s blog. 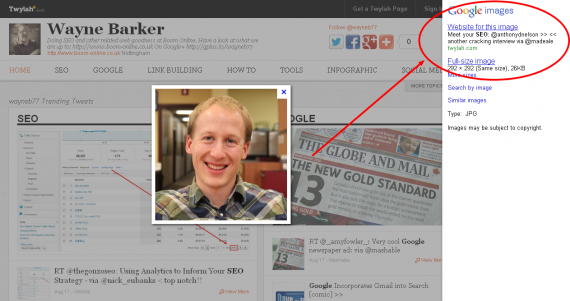 Chris is well-attuned to marketing, specifically link building. Actually, I noticed a number of personalities related to link building within the first few pages of results, namely Ian Howells, Julie Joyce, and Anthony Nelson. Done and done. If I wanted to better professionally associate with Wayne, I’d tailor my recognition to his interests. Let’s be honest. You’re at a convention. 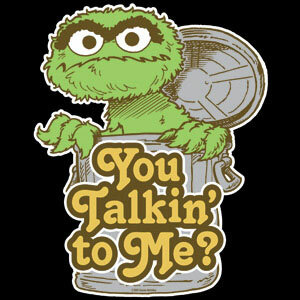 You spark a convo with a peer. Do you want strictly speak ‘shop,’ or does some other interest affect your being? Oh, good. What are a particular person’s interests? Do you share any in common? I recently wrote a post, championing the notions of using graphics for further entertainment and education. AJ Kohn’s cattraction toward felines was used as an example. Coincidentally, AJ came across the post and got a giggle out of my observation. If I wanted to conduct an outreach to AJ I may get a better reaction, form a better initial relation, by mentioning his interest. As Chris Countey once humorously recognized, AJ also entertains Google Plus followers with images from around the world. Again, it’s a commonality. We’re observing from afar, taking interest, and engaging with better associative power. You want someone’s interest? Take interest in them. I used Google Image search to showcase concepts. But see the forest through the ‘debris trees.’ Use other platforms for image perusal too! Wil Reynolds’ ‘stalking for links’ presentation was definitely an inspiration for this post. I hope readers understand the notion of learning about the targeted individual before approach. I understand, amid a largely-scaled link building our outreach campaign, such devotion takes time. A maxim states, “A pictures speaks a thousand words.” Hopefully, considering the visual and timely notion of glaring at pictures saves time while (still) genuinely aiding in outreach and forming relations. Thanks for reading! This is a guest post by Anthony Pensabene, the king of commenting and social interaction. 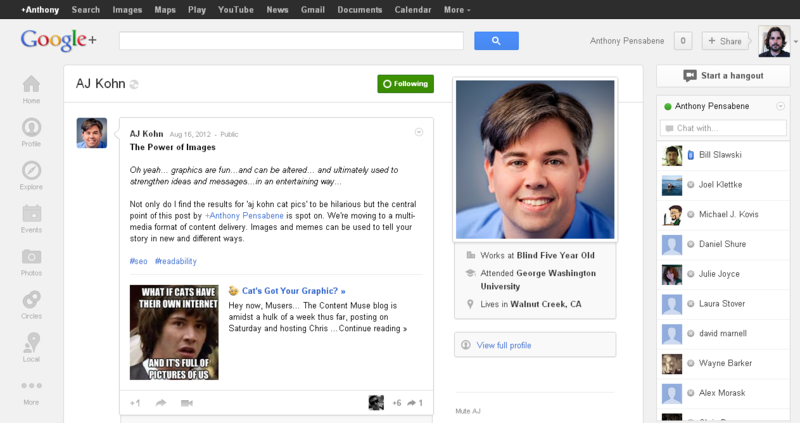 Follow him on twitter @content_muse, add him to your Google+ circles and read his blog for online marketing inspiration.